Nothing disappoints me more than hearing respectful parenting misinterpreted as abandoning children to fend for themselves in every social situation and behave however they wish – a false interpretation that, sadly, gives Magda Gerber’s approach a bad name. As much as I believe in offering children opportunities to develop social intelligence experientially and supporting them to explore and experiment with only minimal intervention, I also believe that kids need and deserve our help to behave within the bounds of social rules and mores. It is never respectful to give children free rein to disturb, interfere, or otherwise behave rudely or aggressively. Loving our kids means not only ensuring their physical safety, but also protecting them from being perceived as brats or bullies. Though the unavoidable will happen, there is much we can do to help them succeed. Calmly observe and spot babies and toddlers when they are using equipment or structures that are relatively high off the ground or present other possible dangers. This is particularly important the first few times a child attempts new challenges or when there is another child nearby, because even the most agile child can be bumped and knocked down by another. Children need our help if they have a tendency to behave unsafely or aggressively with other children, or are in the presence of others who seem unsafe or aggressive. Buddy-guards are the epitome of “chill” and offer emotionally neutral interventions and protection rather than anxious hovering or disapproval. As buddy-guards, we block hitting, biting, pushing, etc. as competently as possible while matter-of-factly acknowledging the impulse and the feelings behind it (if those are clear to us). For example, we might place our hand between the children to prevent or deflect the unsafe behavior while acknowledging, “You feel like hitting. I can’t let you hit. It seems you don’t want this boy so close. Maybe one of you can move over a little.” Buddy-guards understand that this is impulsive, unreasonable, typical behavior and that verbal reminders alone or scolding will not be helpful in preventing it. Kids need our assurance that we have their back as they pass through these uncomfortable phases. If aggressive or unsafe behavior persists, we can be certain our children are signaling their overwhelming discomfort (perhaps they’re feeling too tired, hungry, or emotional) and need to leave. To help our children succeed we must ensure that they follow the “house rules” of any particular environment. This means helping them to understand or at least adapt. We may personally disagree with some of the specifics of that framework, but it’s not our prerogative to argue or try to change them. For example, we may believe a friend is too rigid in her rules for her kids’ play or disagree with her policy that kids should sit while they eat or drink, but we’ve made the choice to insert our child into the situation, so we must accept our friend’s rules. It’s not our place to question or test these limits, nor is it respectful to leave our children high and dry. A public playground is no different. 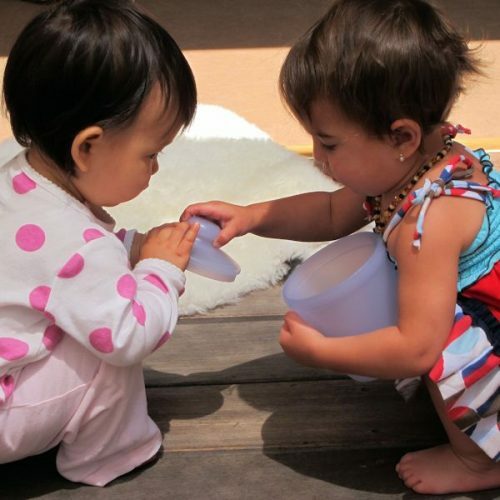 There are certain rules of interaction and play that have evolved for the local kids, and we should help our child – as a guest – to understand and abide by them. The ability to adapt to ‘local custom’ is a basic element of social intelligence that will serve our kids throughout childhood and beyond. Call me strict, but for both courtesy and safety reasons, I don’t believe in allowing kids to do anything remotely disturbing in public places, which includes being loud or noisy, running around, taking items off of shelves, etc. The way I see it, we owe it to our children to protect their dignity in these situations. If they can’t manage to be there, it’s time to take them home and reconsider the appropriateness (or at least the timing) of bringing them again. Children are often able to follow our verbal requests and directions, but I would always be ready to follow through promptly with gentle physical assistance. Social situations tend to be highly stimulating and distracting, and even children who know the rules quite well can need our help in following them. Or, perhaps, we help our toddler, who is experiencing typical, age-appropriate possessiveness, to choose a few toys that he might possibly be okay with sharing with the cousin that will be visiting later that day. This can raise the odds of a more successful, peaceful playdate, though with toddlers there’s never a guarantee. Once we’ve set our basic limits, I believe in letting children do the rest. In other words, once I’ve prevented my child from taking a toy from a peer at the park (or if I was too late and she took it, helped her to give it back), then I wouldn’t suggest to the children that they take turns, or try to comfort my child by offering another toy to play with, etc., all of which would be imposing my own adult mending on the situation. Why not? From what I’ve noted in my 20 years of work with infants and toddlers, our solutions and directions completely underestimate our kids. I’ve seen children settle these situations in a myriad of ways or, just as easily, decide to just let go of them and move on, which I perceive as flexible and powerful. Our interest in making it work for our kids tends to stem from our own discomfort and personal projections that do not reflect what our children are actually feeling or needing. Our interventions can unwittingly teach children that they need us to erase their disappointment and show them what to do next, but they learn so much more and build confidence when we acknowledge their feelings while resisting the temptation to fix things. And beyond ensuring their success by setting appropriate limits, what our kids need most from us is our basic trust in their social learning process. Healthy self-confidence and social intelligence will always go hand-in-hand. My boy is 3y3m. He is a very active boy and loves to play rough. I was called in by the school to say that he had been really aggressive the past 2 weeks and they recommended I send him to a therapist. Firstly I wondered what had changed in the last 2 weeks. The only thing I could think of was that he started a steroid nasal spray. Could this cause aggression? Secondly, he has been under alot of pressure at school wrt potty training. They do not allow nappies and he has been soiling his underpants. He is then cleaned in the bathroom which has no doors and I can only assume the kids are teasing him as he told me he hates it when the kids laugh at him. A few kids have also run to me when I pick him up to tell me that he has pooed in his pants. Perhaps this has affected him? I know the pressure on potty training is concerning, but the school is not open to putting him back in nappies. My only choice is to change schools and I would hate to uproot him again. He seems to love his school. Lastly, I have not noticed that his “aggression” is anymore than other boys. Would you recommend a therapist? Would this really be beneficial at such a young age? We have had many chats about using words and not our hands to show anger and I have seen him do this often lately. He can literally repeat our chats verbatim. So he knows the rules. Your opinion with be greatly appreciated. Hi Natalia! Knowing the rules and being able to manage one’s impulses at this age are two different things. My sense from what you’ve given me is that he is displaying impulsive behavior due to stress that he feels around the toilet training, and also perhaps the teachers’ responses to him. I am not aware of there being an behavioral result from nasal spray. It seems that he needs a calm, empathic response from his teachers, but that they are overwhelmed and unable to give him that. I don’t sense he needs therapy. BUT, I would listen to the school when they say that he needs outside assistance, because they do not feel comfortable handling his behavior. This might be an indication that another school would be better for him. Thank you so much for discussing this issue. I think this message of protecting our child’s dignity and helping them understand acceptable public behavior and social boundaries gets lost in the RIE world. When my daughter was young and we were still attending RIE classes, there were many discussions about how to deal with other parents and children in public places or during playdates and some of the parents seemed to avoid any social situation because other people were “not RIE”. I’ve come to understand that the principles of RIE have helped me to develop a respectful and nurturing relationship with my daughter but that I can’t control how the rest of the world does things. I can only support her in dealing with it. Thank you again for addressing this! Always a profoundly insightful and wise read, thank you. Hi Janet, this is really interesting, but it raises one big question for me. If your child has no siblings, then playdates with other families (who typically don’t practice RIE) and encounters on the playground are the only opportunities for him / her to learn about sharing / turn taking etc. It sounds totally reasonable to adopt house rules (or playground rules), but if we do so then none of our child’s interactions with other toddlers will be guided by RIE principles. How can we give him the opportunity to learn through his own interactions, in the way you’ve described, in this situation? 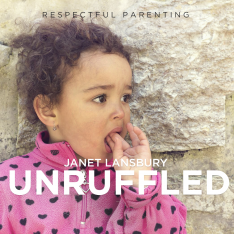 (Parents in our community typically enforce “sorry”, turn taking and sharing, often appearing embarrassed when their toddlers are reluctant to comply). Following. I am in this exact situation with my 15 month old. Thanks for posting your comment, Karen. Thanks for this thought-provoking and helpful article. I, too, don’t like with RIE inspired parents are mistaken for raising their kids to be rude or risky. Thanks, Sara! I’m with you on avoiding situations that require too much monitoring. I hate interrupting children. To your point about a developmental shift… it’s been my sense that children (who are highly, highly aware in these early years and phenomenal learners) begin to understand different “norms” and “frames” from birth. They can differentiate between the way mommy or daddy or grandma hold and interact with them, for example. They have an astounding ability to pick up on these nuances. So, while I do believe that it is stressful to children to be expected to handle a great number of frames (i.e., several different classes or activities per week), I also perceive them as quite capable of adapting to the difference between an empty park and one in which there are other children. They just might need us there to back them up by providing safety and reminders, which is what this post is about. I think this is all fantastic advice! I really appreciate this method of parenting. The last note got me thinking though about a situation that happened this morning. We went for coffee at a friends house and my daughter and my friend’s daughter got into a little disagreement over a small bike. My friends daughter came to tell me that my Gia sat on the bike even though she had it first. So I went over there and let told G that Mary was upset that she sat on the bike before she had finished with it and then I just sat there while they talked. eventually Gia got off the bike and found something else to do, which is great, but should I have helped her get off sooner? I know my friend would have made her daughter get off immediately if the roles were reversed. Thank you, Hannah! I actually would not intervene in that situation, because I don’t think it’s helpful for either child for us to come to the rescue that way. If your friend’s daughter came to you with that information, I would just acknowledge and encourage problem solving. For example, I might say, “Ah, you had the bike and then Gia sat on it? Hmm… Did you let her know that you wanted to use it? ” I would that as an open door and not be eager to fix the situation myself. Oftentimes, children just want to bounce things off of us. They are not desperate for “help.” Or perhaps your friend’s daughter is used to being treated as a victim and rescued in these situations. In that case, this might be a wonderful opportunity for her to build confidence in resolve her mini disputes. I wouldn’t say that to her, but I would project my trust in her as a capable person and do Magda Gerber’s magic word… “wait”. I’m off to International Play Iceland today (a wonderful conference/adventure organized by play genius Tom Shea), but I will respond to your comments as soon as I can. Thank you for sharing with me! Thank you – have a great time! Thanks so much for this information! I know lots of parents struggle with the toddler years for their children – it can be a pretty confusing time. It’s good to know there are techniques out there that can really help your child grow. 1. about sharing. I often wish they were posters in public playgrounds showing the positive effect of NOT telling to share. I love how you phrase this: “our solutions and directions completely underestimate our kids.”. It is so interesting and rewarding to watch how children negotiate a solution to the situation. 2. about not being a nuisance in restaurants, etc. Thank you for phrasing this so clearly. Talking before entering the restaurant really helps. I remember a very funny time when my son, R, was 2 (he is now 4). We were invited at our neighbours for dinner. I had explained to R the need to sit at the table for dinner, etc. He enters the neighbour’s flat and throws a very brief fit, pushing a few books against the back of a shelve. I didn’t particularly react because I trusted him so much (it was hard because I didn’t want our neighbours to think they were in for a hellish night with a boy whose mum was not going to intervene). That was the only thing “off” that he did. He was perfect all evening. Sat a the grown up table, ate everything that was put in front of him with his little fork…. What a balancing act parenting can be! let children figure out how to deal with a situation where they seem to both want the same toy but be very strict about behavior in public places. Phheeeww…Thank you for your enlighning guidance once again. You’re so welcome, Cecilia. Thank you for sharing your stories! So happy to see this post. It explains so much. I’ve forwarded it to Anna Tardos and the people at Loczy and I will bring it with me to their training in June to get their input on your ideas. That would be awesome, Ruth. I’d love to hear what they have to say. Thanks! Dear Janet, Thank you for another great article (and for the mention). I thought I would share this: R and I walked to the park together this morning. She wanted to take her beloved stuffed “mama cat” which she tucked into the stroller basket. We had been at the park for a little while when a little girl who was about two years old and holding a stuffed dog, noticed R playing with mama cat. She watched with interest as R tucked it back into the stroller before running off to climb on the slide. The little girl then made her way over to check out the stuffed cat. She started to remove the cat from the stroller when her mom came over and quietly said, “You are so interested in that cat, but I can’t let you take it out of the stroller, because it belongs to that little girl (indicating R, who had come running back to where the stroller was parked).” The little girl said, “I want cat.” Her mom said, “I know, but it isn’t yours, so you have to ask the little girl it belongs to if you would like to hold it. It’s her special cat, like puppy is your special puppy.” The little girl reluctantly put the cat back, while turning to R, who had been listening. R (age 3) suddenly piped up, “I want to share my cat with you. It’s OK if you hold her. Her name is mama cat and she has a flea collar and you have to be gentle with her.” The little girl grinned and picked up the cat, and hugged it tight. Then she walked over and offered her puppy to R who politely declined . After hugging the cat, the little girl tucked it back into the stroller and ran off to the swings and R went back to the slide. I did nothing but watch this interaction unfold. So often, I read horror stories about park interactions, parents either over or under directing children. I thought this was a beautiful example of what you described in your post, of adults supporting children just enough to allow them to successfully navigate a potentially tricky social situation. I have never asked or instructed my girl to share. There have been times when I have stopped her when in a public place and pointed out others and encouraged consideration for social etiquette and the feelings of others, for instance when she’s wanted to climb up the slide when others are waiting to go down, or she’s wanted to pick flowers from a garden not ours, or while at the park, (like the mom we met today did), when she has wanted to play with a toy that was clearly someone else’s from home. It never ceases to amaze me how if we just trust young children, model, let them be active in their own process, and put relationship first, they are able to shine in social situations, learning to share, take turns, co-operate with and respect others in an authentic way. would you be able to give me the sports cast or buddy words for when my child is following around a child trying to un do his zip, the other child has quietly said no thank you several times, moving to i don’t want you to do my zip, to then in a slightly raised voice, go away… my daughter then hit him, he ran away and she chased him. perhaps i shouldn’t have let it get to that point but i only saw what was going on just before the hit….. Socially active children are perpetually great at understanding the things faster. Several childcare centers like Williamsburg Northside Daycare and others are involving their kids in cluster outing, playing & learning activities. You mentioned very valuable and informative stuff, thanks for sharing. Love this article! I am one of those parents that you talk about as intervening too often. Now my 4yo has become totally dependant on me to fix any problem she is having. Could you please give me some advice on how I can help her to become more independant after having been dependant on me for so long? I love all your articles and feel they have changed me as a parent dramatically. Thank you. But I am a little confused… I’m not sure what should happen once you sports cast, as in getting to a resolution, especially in the context of one child wanting a toy someone else is playing with. I suppose that’s the part you leave to the kids? Second question- should we encourage our children to say sorry? I am a primary teacher and it seems to be strong in school culture to encourage apologising (even though I know that children don’t always mean it). And after sports casting do I just wait for the children to interact and come to their own resolution, whatever that may be, being mindful of safety? Thanks for your interesting articles that always make me think and continue to improve my parenting. An honest question here – why is it strict to ask that your child sit during meals? I do because I don’t want her to choke on her food were she to fall, and we have carpet in a rental that would quickly become filthy. Does RIE subscribe to the grazing philosophy? If she is at childcare at the YMCA she is allowed to walk around because that is what the minders allow and I’m fine with it. Hi Amanda! Hmmm…. I think my example may have been confusing. RIE (and I) do believe in insisting that children sit during meals for the reasons you mention and more! I was suggesting that we conform to those house rules, whether we ourselves believe in them or not. I should probably have used a different example! No, Magda Gerber definitely did not subscribe to the grazing philosophy. We believe that children should be fully present and focused at mealtime and not leave the table until they are done eating. Lots of people tell me it’s just a phase, but it seems to be lasting forever. How do you “reinforce” her achievement? I hope not by rewards or praise… Read Punished By Rewards by Alfie Kohn for clarification on why so-called “positive reinforcement” actually turns kids away from whatever behavior you praise them for. I struggle all the time, because my kids are close in age, with being a buddy guard to my 4 year old and also a spotter for my 16 mo th old, while making sure my 6 year old is maintaining boundaries, house rules, etc. I can’t do all 3. But I also can’t stay home every day! Carla, is it possible you are way too involved? Are you talking about your life at home or when you are out and about? I have two boys, 3 and 1. I agree and try to follow so much of this. But it is so incredibly hard with more than one child! It is very difficult to be an active observer with a 3 year old while also keeping the 1 year old from eating gum on the ground;). Any techniques for finding this balance? Read thst with great interest. However there is one situation here that I wouldlove to hear advice about: Public place,public toys and a toy is snatched out of your child who starts crsying but will not fight for it. Or your ball, toddler comes to play with your child but takes the ball to himself. Parent don’t react, my child is crying. I struggle to deal with those situations. Perhaps fue to lack of self confidence and I am afraid my son will be similar as I just keep comforting him. Should we practice at home how to look after himself in dimilar situations? Teach him to say no and hold on to a toy? I’m lost. My daughter is 18 months and is always handing off anything she finds or has to other kids. It can be a rock or a toy, she grabs it and takes it to a child, typically an older 3-5 year old. They’ll take it and set it beside them and she picks it up and keeps handing it to them, Over and over. After a couple times, they get annoyed. I try to explain to her that they don’t want to play with that item right now, and I’ll play with it with her. But she doesn’t respond to me. Eventually, I take her to a different part of the park/playzone, but she gets so so upset since I moved her. What’s the best response when she’s trying to share over and over and the other kid doesn’t want to play with it? I’m trying to let her figure it out but I always don’t want to let her bother other children. How do you deal with other children acting rudely and aggressively with your own out in public? Today at the children’s museum, a boy kept trying to pull a train toy out of my 3.5 year old daughter’s hand. I waited and watched to see if they could resolve it, then saw he was almost pulling her down trying to tear it away. She was telling him not to take it and that she was playing with it. I went over to ask if I could hold the train while we figured out the problem. The boy finally gave one last yank and got it out of my daugjter’s hands. At this point, I can’t take the train out of a stranger’s kid’s hands and my daughter is beyond upset. How should I have handled this? Sportscasting was not working, but I want to learn some skills that might help similar situations in the future. Just a question on the toy taking. 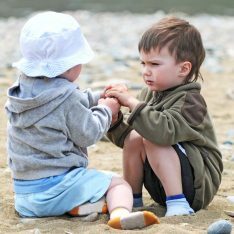 In a sibling article you mentioned that you would not stop a child taking a toy from their sibling, but with the same scenario you should stop a child from taking a toy on a play date. Would that confuse the child for a sane situation in different scenarios? Great question, Shauna. Children will not be confused if we are confident and clear. Awareness is very high in these early years and our children know quite well that each of these circumstances is different.